We’re very excited to host the Victoria leg of Andy Gordon’s launch tour for his fantastic new album The Reverend Jorfy, with support from local favourites Sarah EiDA and Erik Parker. This is an event not to be missed. Andy Gordon (roots/blues/folk): Andy Gordon’s new album The Reverend Jorfy was born out of a deep desire to create art – art that is best appreciated in an intimate venue like The Chandelier Room. There is a story to the album, to the songs, to them coming together, and to the journey. 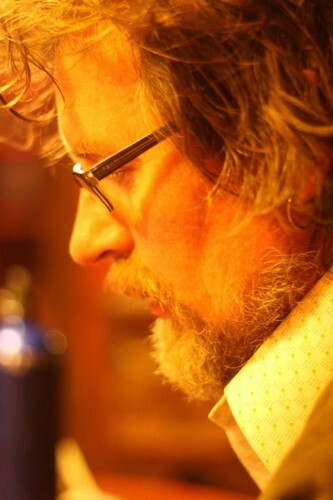 Andy has been writing and performing for 28 years, previously playing in Luminous with Matt Clyde and Jeremy Butterworth (ex-Bhagavad Guitars), and has contributed songs for tribute albums to Nick Drake, Elliott Smith and Jeff Buckley. Those three names will give you a rough idea of Andy’s music – atmospheric, melodically vibrant, and emotionally resonant. Sarah EiDA (indie/rock/goth): The Sarah EiDA live experience is a whirlwind of acoustic riffing, a voice that veers from whisper-quiet to full-on tsunami, and songs that are dangerously catchy. Sarah released her debut album Lady Wolf last year before heading to Canada, and we’re excited to welcome her back to our stage. Head down to The Chandelier Room to witness the Lady Wolf herself in action! Erik Parker (folk/blues/jazz): Erik’s smoky and raw music hangs in the air like a spectre, haunted and homeless, with New Orleans on its mind. Follow the gnarled threads of these song-stories and you’ll find yourself ensnared.